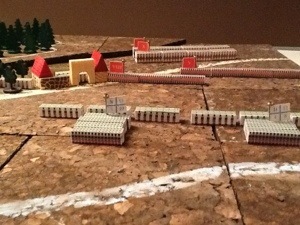 This is a scene from my wargame system that I call “Est-il heureux?”, meaning “is he lucky?”, the question hat Napoleon reputedly asked of his new generals. The game is designed for display of historic battles at Napoleonic re-enactment events, as well as being a quick game to play at home. The idea is to show something that could have been invented and created by an old soldier to relive his past glories, and as I now play the role of a pensioner of les Invalides, it is a good way to pass the time and educate and entertain the visitors. The troops are represented by wooden blocks covered with printed paper soldiers. Houses are from toy shop “village in a bag” and two dimensional trees are from christmas decoration suppliers or commissioned from my own design. The ground is represented by stacked cork wall tiles with roads and rivers chalked in. All movement and combat is controlled by dice with red, green or blue coloured faces, keeping the game simple and easy to remember. I hope in the near future to publish a blow by blow account of a battle using his system. 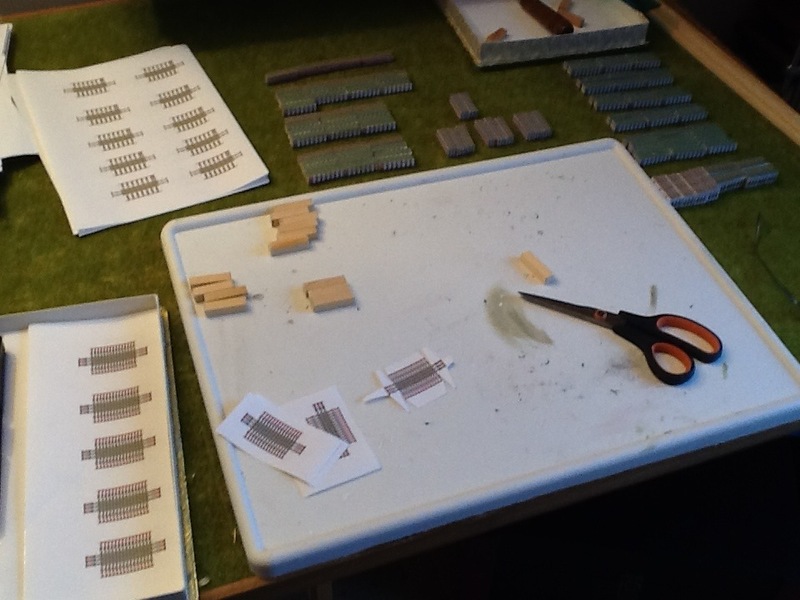 Today I am busy producing more troop blocks for a forthcoming game set in Spain in February 1813. For this game I will need a lot of red skirmish infantry representing Spanish guerrillas, and some of the new designs representing infantry and cavalry in march column on roads. In the picture are completed blocks and some of the printed paper covers for the unfinished blocks cut from 12mm pine strip wood.